Karsten takes Photoshop to a new level…Or location anyways. I showed the kids a video of “The Yodeling Kid,” and nobody was really impressed. 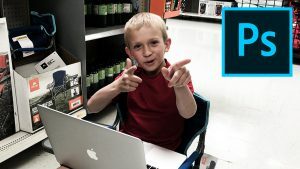 Karsten had the idea to go get a Mother’s Day card so we figured we would try our hand at Photoshopping inside WalMart. Both kids were nervous about getting kicked out but hey, the yodeler didn’t get kicked out. Follow along as Karsten shows you three quick ways to do shadows and reflections in Photoshop. Super simple and fun. We start out with the subject on its own layer, so be sure you know how to cut things out already. Remember, we’re trying to be as non-destructive as possible.